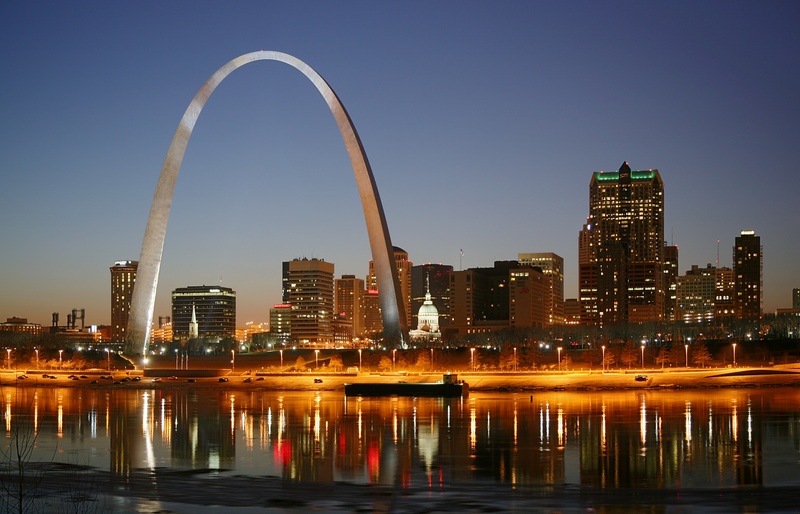 St. Louis, located in east central Missouri on the Mississippi River, is the second-largest city in the state. Incorporated as a city in 1822, St. Louis prospered as a fur trading center and, due to its prime location on the Mississippi, quickly became a major transportation hub. Today, St. Louis has around 320,000 people in the city and a metro area with 2.8 million residents remains one of America's top cities. The city is one of the world's beer capitals, with Anheuser-Busch Breweries headquartered there. The city is also home to several major companies, including Monsanto, Solutia and Energizer. A Boeing plant is also located in the city. St. Louis has a thriving nightlife, helping it rank #22 on the Forbes list of the Best Cities for Singles. With Anheuser-Busch based in the city, would you expect anything less? The historic Soulard neighborhood just south of Busch Stadium is the city's best place to see live music, with many clubs within walking distance. Laclede's Landing on the Mississippi River is a large area packed with restaurants, bars and nightclubs, and with easy access to riverboat gambling casinos. If you're interested in St. Louis, please email your resum� with an introductory letter to to Dayna Lynn at dlynn@fsgltd.com or fill out the form below.